Ideas have value, that’s the core principle of our economic system and that’s why you need to create your own way of understanding the value of your project or patent. The free Project or Patent as Option Template is the perfect tool to help you get started with that endeavor. You will be given a set of rules and asked for certain data about your patent or idea. When you enter that data, the free template will give you valuable feedback instantly. You can see how useful this is when assessing the value of patents or holding that your business might possess and then make decisions on where to go from there. To try this template for yourself, read the guide below. To download your free template file to the computer, simply click the link that we have conveniently provided for you at the bottom of this page. The next step will be to read the assumptions and how this template applies variables at the top in the blue table above. Now, enter the data that the template requires in the highlighted cells below. 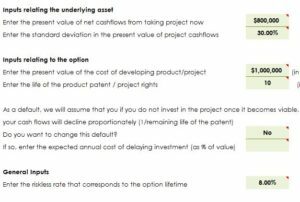 You will enter items such as the current value of your project, patent, or holding, the standard deviation for the present value of cash-flow, the expected cost of holding, etc. This will carry you down to the black table near the bottom of the template. This is essentially the information that will help you decide whether you want to proceed with a project or keep the asset in question. You will see the value of your stock, bond rate, variance, annual dividend yield, and much more. This template just makes it easier to make an informed decision about the value of your stock, patent, or project by applying real-world criteria to the concept.